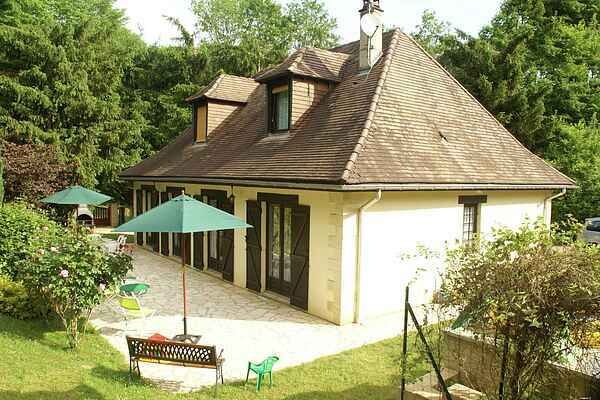 This holiday home is located in the heart of the Dordogne. The private swimming pool is there for a refreshing dip in the morning. Then you can enjoy a wonderful breakfast in the enclosed gently sloping garden, or on the patio. The children can fully amuse themselves on the swing or playing table tennis. The castle of Beynac-et-Cazenac (16 km) offers a fantastic view over the valley of the Dordogne. Another beautiful place of interest is Château des Milandes (19 km). This was once the residence of the singer and actress Josephine Baker. Now it is a museum with a superb garden, where falconry shows are held regularly. Don't forget Castenaud-la-Chapelle (12km) and it's beautiful medieval castle, one of the most famous in the region. The lovely town of Sarlat-la-Canéda (7 km) offers pleasant shopping. There are authentic streets, gateways and alleys to stroll around and, of course, charming outdoor cafés for a drink. The renowned Rocamadour (50 km), popular place of pilgrimage, is well worth a visit. Between the town and citadel lies the Parvis des Églises, with its seven shrines. Near Le Bugue (37 km) there is a great water theme park for entertaining the children.